Sri Krishna Balaram Mandir temple is a Hindu temple located in the Vrindavan town of Mathura. It is known as the ISKCON temple of Vrindavan. 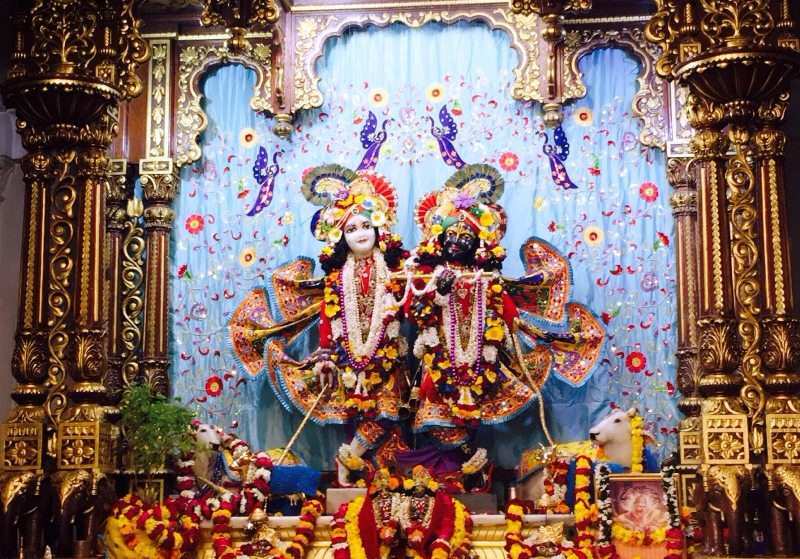 ISKCON temple Vrindavan is located in Raman Reti area of Vrindavan, Mathura. Krishna Balaram Mandir was inaugurated on the auspicious day of Ram Navami on 20 April, 1975. It is a very beautiful temple displaying very good architecture. This temple belongs to Lord Sri Krishna and his brother Balram. Every day thousand of pilgrims visit this temple and offering their prayers to god. Beautiful Deities of Sri Sri Krishna Balaram, Sri Sri Radha Shyamasundar, Lalita Devi and Vishakha Devi and Sri Sri Gaura Nitai are installed in this temple. ISKCON temple was built by A. C. Bhaktivedanta Swami Srila Prabhupada (Founder Acharya of ISKCON Society). A beautiful mausoleum, Samadhi of Bhaktivedanta Swami Prabhupada built near the entrance gate after his demise. This mausoleum is built of pure white marble and later it was converted into a museum. It is among most famous temple of the Brij area along with Prem Mandir and Banke Bihari temple. Various sign boards are put on nearby roads and highways are giving directions of this temple. This temple is located in the same region where both brothers used to play here 5000 years ago. Devotees should check the timings of the Krishna Balram Mandir before making a plan. ISKCON Temple, Vrindavan Timings are 5 AM to 8 PM. ISKCON temple morning opening time is 5 AM and it closes at 12 at the Noon. Evening time of Krishna Balram temple is 4.30 PM and ISKCON temple Vrindavan closing time is 8.30 PM after the Shayan Aarti. Various aartis are performed at the ISKCON temple to offer the prayers to the god. ISKCON Temple, Vrindavan Aarti timings are displayed below in the table. It is located in Raman Reti area of the Vrindavan town of Mathura, Prem Mandir is also located in this area. ISKCON Temple in Prem Mandir distance is just 500 Meter. The nearest railway station is a Mathura Junction Railway station, which is just 10 KM from here. The nearest airport is Agra airport, which is around 80 KM. Distance from New Delhi is around 150 KM. Vrindavan town falls under Mathura city, Mathura city is well connected from the rest of the country and remaining journey can be completed by local mode of transport. A well maintained shoe cloak counter is located in the safe keeping of the visitor’s shoes. Prasadam shop, cafeteria, book stall, gift shop, souvenir shop is located inside the temple. Parking facility is not available on temple premises. Visitors generally park their vehicle in unsecured parking on the main road or vehicles can be parked on Prem Mandir paid parking. Also check Prem Mandir and Banke Bihari Temple of Vrindavan.